Satnav can be confusing as the above postcode takes you to a locked gate - so it is best to use RG45 6DY which is the nearest postcode on Duke's Ride. Enter the Wellington College grounds by the entrance on Dukes Ride, and travel for about 500m before turning right towards the main school buildings. You will pass the main car parking area. Immediately in front of the school buildings turn left and follow the road for about 100m. The Old Gym can be found on your right. Note that there is limited parking available in the vicinity of the Old Gym. From Dukes Ride, drive down The Avenue and turn right at the end (on to Ellis Road). Then take the first turning left, which is Butler Road. Just past a road on the right (Grange Avenue), you will find the school drive on the left. From New Wokingham Road take one of two turnings left before the cross roads and lights on Dukes Ride – either Greenwood Road (and then take the first right into Butler Road at the top of the hill and the school is on your right), or Ellis Road (and then take the first left onto Butler Road, and the school is on your left as above). The school is signposted in various places. 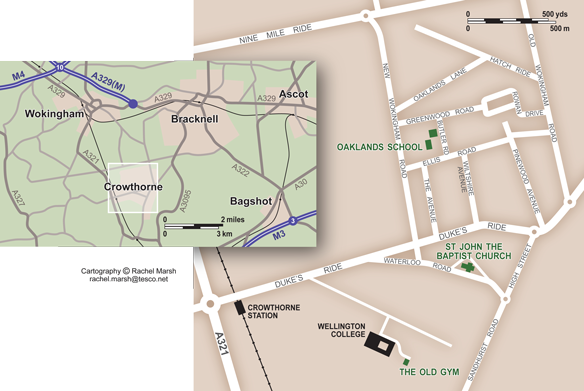 St John’s Church can be found along Waterloo Road, which can be accessed from Dukes Ride or from Crowthorne High Street. The Hall is attached to the church and the entrance is to the rear. Parking spaces are available on Waterloo Road, or behind the church on Church Street. Church Street is an unmade-up road which is accessible from Waterloo Road (but not Duke’s Ride).